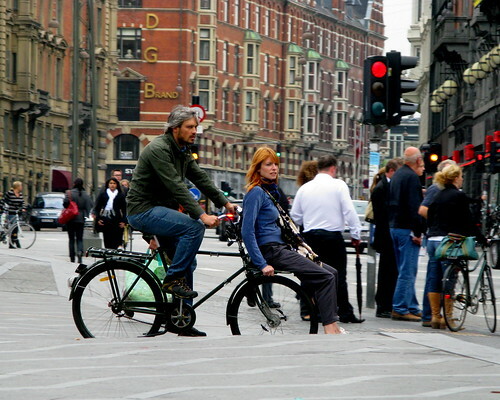 Couple doing Copenhagen on their Swedish Kronan. Even though the truck passes at a safe distance in another lane, it's always a good idea to glance over to make sure you're safe. 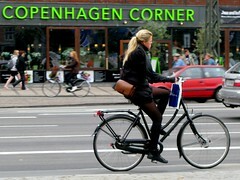 You can now become a fan of Copenhagen Cycle Chic on Facebook which, of course, means absolutely nothing at all. But do it anyway please and thank you. That's it! That's the finally straw! I am packing my bags and moving to Copenhagen. Zack, would you be so kind as to let me which bike that is in the top picture that comes with a hot redhead attached? hey. thanks. just click on the words Short John in the blogpost to find out what it is. Here in Mozambique you can see the same everyday. Man transporting woman. I have to take a photo of that and send it to you. They´re offered with an optional front carrier. By george, you're right naesemand! thanks so much.